The mighty Han River runs through this skyscraper metropolis of mega conglomerates and massive condominium complexes. Mountains scale the sky far off in the distance. This is our first impression of Seoul as we breeze along at 80km an hour on the city’s excellent metro system for the 78kms between the airport and the subway stop, landing us a half block from our home-away-from-home – the GS Hotel. Just off a main thoroughfare the GS, new in 2012, is pleasing in its modernity and cleanliness. Speaking of cleanliness, in this city of over 10 million the streets are outstandingly litter-free wherever we walk – and walk we do – at least six hours a day in varying directions to absorb the culture. And no matter the direction taken, we are only steps from a cappuccino with the ubiquity of coffee shops (of familiar and new-to-us franchises); some blocks have as many as three or four. 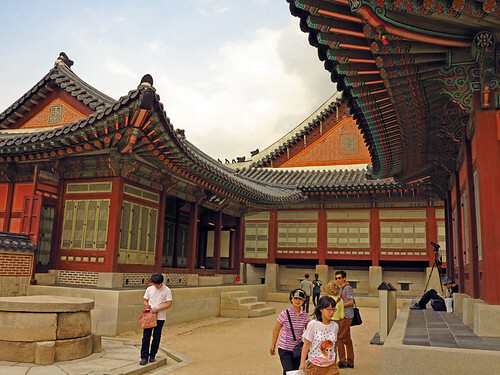 Korea’s history is long, dating back to 8000BC based on archaeological finds, and kingdoms from 2300BC. Our focus fast forwards through the millennia to the last major kingdom, the Joseon – the period which the palaces in Seoul stem from. Joseon came into being in 1392 when General Yi Seong-gye named himself the first king of this powerful dynasty that ruled almost five centuries. A fascinating figure and national hero during this dynasty’s rule was naval commander Admiral Yi Sun-shin. In the late 1500’s he defeated Japanese aggressors with his fleet of ingenious “turtle ships”. These vessels were armoured with thick wood planking, iron shields and spikes that were capable of ramming the Japanese ships without sustaining damage themselves. Changdeokgung is the first palace we visit. Originally built in 1405 as a secondary palace, it became the main one after the much larger complex of Gyeongbokgung was destroyed. Changdeokgung is the only palace in Seoul to be named a UNESCO site, due to its design retaining many elements of older kingdoms which adheres to Fung Shui, harmonizing the structures with the natural topography of the land. Finding out there is an additional charge to see a “Secret Garden”, we decide to forgo the revelation of its secret. On the same day we continue on to the busy Jogyesa Temple. Devotees light candles near an outside pagoda, while others twirling prayer beads sit in the shade of locust and baeksong trees; the most sizable tree is over 500 years old. Through the large wooden temple door there is a steady flow of people entering or leaving. I wedge my way inside and find there is barely room to manoeuvre between the worshippers sitting on mats before 3 giant golden Buddha statues. I gingerly move towards the centre to better view the walls decorated with colourful murals of Buddha’s life. The atmosphere is one of bustling tranquility. Strenuous, but worth every ounce of effort, is our next day’s climb up the 338m-high mountain, Inwangsan (meaning Benevolent King Mountain). Shamans were drawn to its mystical qualities since the dawn of time. Today it remains one of the most active Shamanistic places of worship and has also taken on significance for followers of Buddhism. Our trek begins up a winding road, followed by a lengthy series of stairs that pass small Buddhist temples and a Shaman shrine along the way. We arrive at the giant meditation rocks known as Seonbawi, believed to be frequented by Shamanist deities. One of the looming rocks is said to resemble a robed monk, but to me the massive granite boulders appear lunar in their darkness with indentations that are strangely mesmerizing. 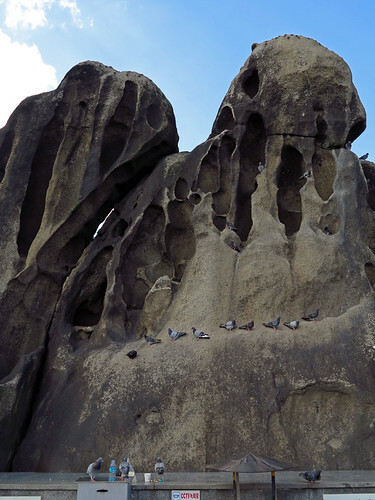 Pigeons flit in and out of the hollows, burning incense is stuck in the crevices, women pray at the base to engage the rock’s fertility powers. We pull ourselves away from the magnetic aura to continue our climb up the mountain. Around the side of Seonbawi is an easy grade path that soon morphs into a steep rocky embankment with well-worn footholds, until the only thing above us is a canopy of brilliant blue sky. We sit among a flock of birds with squatter rights, and take in the splendid panoramic view of Seoul. Another venture is milling around Bukchon Hanok Village. Hanoks are the traditional Korean houses with patterned walls and tiled roofs. It is fun to loose ourselves in surrounds so sharply in contrast with the modern architecture in the not-too-far-off distance. It was here that we consumed our first flaming-hot kimchi in a small restaurant, leaving with watery eyes and voices distorted from the red-pepper and spice soaked fermented cabbage. Kimchi is as Korean as the national flag and eaten in one of its many forms with every meal by locals. We soon glean the fiery effect is manageable combined with mouthfuls of fluffy rice and superb with stewed beef. Hearing so much about Seoul’s street food being a great culinary experience…we’re in! The variety seems endless, but we do our best to cover a wide scope – all delicious! A regular pit stop is right outside our hotel for skewered chicken slathered in our request for “not spicy” sauce, which is bearable for our unaccustomed palates. Then it was off to another stall for fresh roasted corn…yum. And steamed pork buns are right up there….and something called mandu (dumplings fried on a grill filled with meat, bean paste, or buttered squash). Dessert you ask? Hoddeok – sweet pancakes best consumed on the spot, or ice-cream in novel horn-shaped crispy rice tubes. 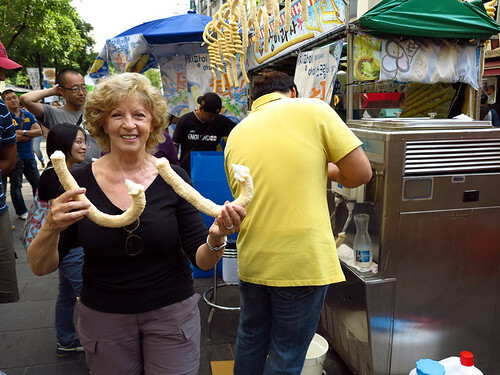 Ohhh….it’s worth a trip here for the street food alone. One morning we wake up to black skies and wild slashing rain. We monitor the situation, but by lunchtime have no choice but to face winds that threatened to pick us off our feet as we slosh our way through a river of water to the 7-11 to stock-pile our room with food and wait out the ferocious storm. We later learn this was Typhoon Sanba that unleashed most of its battering force on the southwest coastal shores. News reports say prior to the storm’s arrival thousands were evacuated and hundreds of flights and ferries were cancelled. Under the next morning’s stellar sun the only evidence of Sanba are a few remaining puddles on the streets of Seoul. A few days later we rise early for our tour of the DMZ (Demilitarized Zone). By 7:45 a matronly middle-aged lady who speaks no English, comes to fetch us from our hotel lobby. Where is the English guide we were promised? Whew! Our 30-ish-aged guide Aaron Lee (who says to just call him Lee), whose English is impeccable is waiting inside the bus. He introduces the lady as Mrs. Wong, as she hoists herself into the driver’s seat and handles the mini-bus like a jet-plane. After pick-ups from other hotels – we fly down the highway towards the DMZ – the strip of land running across the Korean peninsula at the 38th parallel dividing the country in half. This was the original boundary decided by the USA and Russia at the end of WWII. In 1948 it became the international border between North Korea (the formal name- Democratic People’s Republic of Korea or DPRK) and South Korea (Republic of Korea or ROK) and was a hotbed of tension during the Cold War. In June of 1950 the Korean War began when the North invaded the South; a war that claimed over 3 million lives. In 1953 with international intervention both sides pulled their troops back and borders were set with a 4km buffer zone in between – the DMZ. After switching from our mini-van to join another group in a full-sized bus, we are first taken to the Dora Observatory. This is a platform from which photos cannot be taken, but if you pay another 500 Korean Won, you can check out North Korea from a telescopic lens – which those who pay say is only greenery and a few building facades. Around the Observatory building are souvenir vendors and small eateries. Seeing 60+ buses in the parking lot, I think about Lee’s comment that over 3 million people visit the DMZ a year. With 15-minutes before meeting back at the bus, we walk alongside the Observatory Building and up a hill past a gong-bell tower where we see barbed wire that defines the South Korean border and the no-man’s-land beyond. 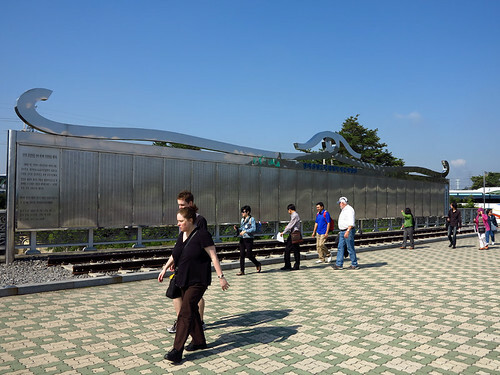 Dorasan Station is next, a 40-million-dollar structure built for inter-travel between the countries. It opened in 2002 in conjunction with a collaborative economic development, Kaesong Industrial Region, located 10km from the DMZ in North Korea. Within a few years factories were up and running; owned by South Korean companies using cheap North Korean labour to compete with China for low-end goods such as shoes, clothing and watches. Dorasan station was briefly used for freight and South Korean management access to Kaesong, until in 2008 the North Korean government decided on an alternate access to the factories, that Lee says, “today employ over 10,000 North Korean workers”. The Dorasan Station we walk into only echoes the din of us tourists, many vying for photos with the few soldiers on duty, who look to still be in their teens. Well, they must be at least 18, as Lee explains in South Korea men must complete 21 months of military service between the age of 18 and 35, and most want to get this done early on. Women’s duty is optional. In North Korea10 years of military service is mandatory for men, 7 years for women. Okay…it is onto the 3rd Infiltration Tunnel – out of the 4 (that have been discovered so far) dug by the North to invade the South. The 3rd Tunnel was found in 1978 based on tips from a North Korean defector. Its location is a mere 52km from Seoul. It runs through bedrock below ground at a depth of 73m, its length is 1.6km, and is 2m wide and 2m in height – capable of moving thousands of soldier (some say as many as 10,000) and weapons through per hour. It is eerie to forge deeper and deeper into the tunnel with wet rubber mats made from tires underfoot and dripping rock walls, often thankful of the hardhat I donned at the entrance when my head clunks a piece of jagged rock lower than the rest of the ceiling. At one point in the tunnel, which ends a safe distance from the North border, is a barricade of stone with a small opening to see that the tunnel indeed goes on into North Korea. The North say it was the South that dug the tunnel to invade them, but Lee says the proof that it was the other way around is the orientation of the blast lines and the downward slope towards the North, so the debris of digging could be removed as the tunnel progressed. The slope is readily apparent by the way I propel down with ease and labour to get back to the entrance. 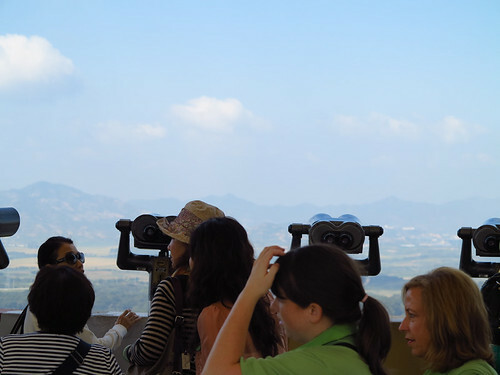 Although our tour only passed by the village of Panmunjeom located inside the DMZ, it should not go without mention. Known as the JSA (Joint Security Area), buildings lie on both sides of the Military Demarcation line (DML) separating North and South Korea. Some situated right on top of the dividing line is where the 1953 negotiations were held, and all meetings between the countries since. Although usually calm, it has been the scene of many skirmishes (tours here can be cancelled with little notice). All-in-all, on a DMZ tour – what you don’t see has more prominence than what you do see – it is the lurking unpredictability of ongoing tensions between the Democratic South and the Communist North. The reality being this remains one of the most heavily guarded zones on the planet with a long list of sporadic hostile outbreaks with casualties in the hundreds between 1953 to present day. It is back to the mini-bus and Mrs. Wong. 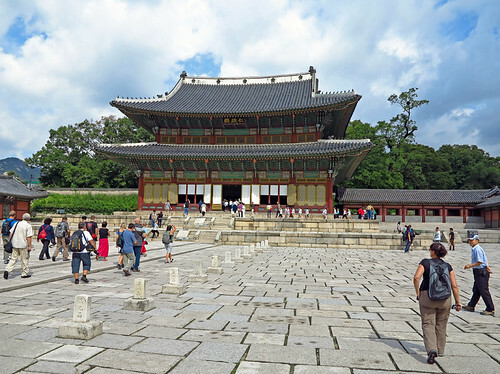 She speeds us to a traditional restaurant for lunch, then onto the Gyoengbokgung Palace, meaning “Palace Greatly Blessed by Heaven”- which was far from its historic reality. It was razed by the Japanese in 1592, remained in ruins until the mid-1800’s, was destroyed again under 19th century Japanese colonial rule…. and what is seen today is the product of two decades of restoration. The best part of seeing this palace complex is having Lee along to relay some day-in-a-rulers-life facts. In the King’s pavilion there were four bedrooms on each side of a large central lounging area – so would-be assassins could not determine which bedroom held the king or which held his attendants on a particular night. The Queen spent a prison-like existence in her separate abode to ensure protection of the royal gene pool, and she could not enter the King’s quarters unless invited, lest he be occupied with a concubine. Our last tour stop is Insadong Street filled with souvenirs, foods stalls, cafes and restaurants. We stop to watch some cute Korean fellows fashion a solid mass of honey into traditional candy. They first knead the honey with cornstarch and form it into a thick rope-like circle. Keeping up a hilarious spiel they continue (between frequent dips in the cornstarch) to pull and stretch… pull and stretch…pull and stretch the honey until it becomes fine white strands as light and airy as I imagine angel wings to be. How can we resist when asked what filling they should fold within this gossamer substance for us to purchase – crushed peanut, almond, hazelnut or walnut. We go with almond and share our box with Lee and Mrs. Wong – melt-in-your-mouth ambrosia! Another day it is off to the sizable local market area of Namdaemun with its bazaar-like commotion! Some of the shops along the streets sell a hodge-podge of goods, while others have a specialty, such as gold and silver jewelry, racks of clothing, or traditional heath remedies. In front of these shops and even plunk in the middle of the streets are vendors with product displayed on small tables or mats – from just-picked veggies, weird looking fish, piles of nuts, local versions of fast-food, to a tangle of cheap shirts and socks. The place rocks with jostling bodies, the sellers calling attention to their wares, delivery men wheeling in boxes of product, and even the odd motorcycle or vehicle driving through this milieu beeping their horns to clear a path. South Korea is our final country on this journey that also included Russia and Mongolia. Our special memories of South Korea are sitting in coffee shops observing the flow of energy, walking until our legs are ready to give out, voraciously delighting in street foods or huge bowls of noodle soup in small hut-like eateries. We find it amazing that the country’s sterling sophistication in technology and modern conveniences does not override the strong cultural traditions upheld in families, even in the younger generations. And the friendly locals we encounter at every turn fills us with an intense warmth – more potent than kimchi. We are now back home in Canada catching up with family and friends, until we are once again gripped by wander-lust – then off we go to… who knows where. 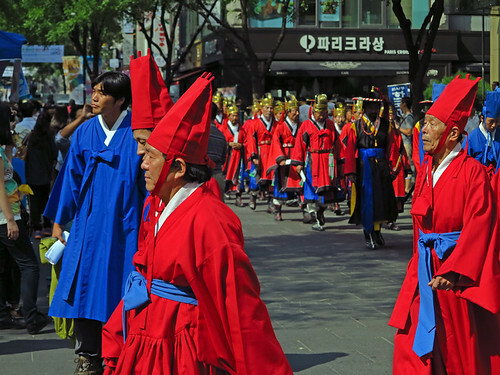 Gwansudong area is in the middle of sightseeing- palaces & museums; and upscale shopping and local markets.